Scientific evidence suggests that the environmental factors affecting an individual’s early life may influence their health in later life1,8 indicating that a more positive health outcome may be achieved by intervening as early as possible9. The individual’s ability to respond to their environment is known as ‘adaptive capacity’ or ‘plasticity’. It is thought that plasticity is at its greatest during the first 1000 days of life10 which is why environmental factors can also have the greatest effect during this period2,3. The prevalence of childhood obesity is increasing with 1 in 5 of 4-5 year olds in England being overweight/obese11. The first 1,000 days of an infant’s life, from conception until their second birthday, are key to determining their lifelong health12,13. This is when environmental factors – such as nutrition – can influence rapidly developing organs and body systems2,3. The 1,000 Days partnership is a worldwide initiative that promotes positive action to improve the nutrition of mothers and their children during this critical period12,13. Many environmental factors have an impact on later health, but diet and early life nutritional exposure are particularly significant2. By making the right nutritional choices from conception to toddlerhood, mothers can make a significant difference to their children’s long term health. There is a growing body of evidence that early life nutritional programming (ELNP) can affect both physiology and behaviour. ELNP can affect both behaviour and physiology. Metabolic – processes may be set during early life, determining how the body learns to break down, absorb and use nutrients for lifelong growth and development19. Immune – immune system development may be influenced, affecting the future risk of asthma and allergic diseases20. Cognitive – brain development may be influenced, with potentially long-term effects on cognitive function and behaviour21. 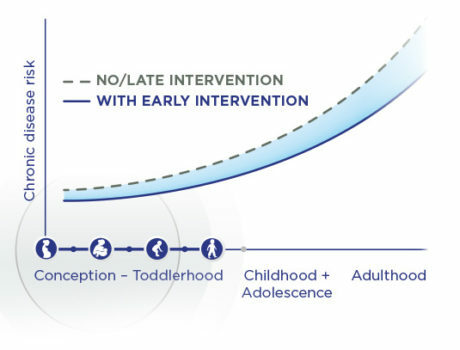 Healthcare professionals’ nutritional intervention from conception to toddlerhood may have a lifelong impact, supporting optimal health with the potential to positively influence long term health outcomes2,3. Scientific Advisory Committee on Nutrition. The influence of maternal, fetal and child nutrition on the development of chronic disease in later life. London: TSO, 2011. British Nutrition Foundation Task Force. 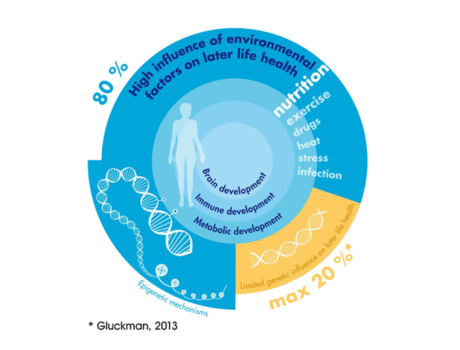 Nutrition and Development: short and long term consequences for health. Chichester: Wiley-Blackwell, 2013. Hochberg Z et al. Child Health, Developmental Plasticity, and Epigenetic Programming. Endocrine Reviews 2011;32:159-224. Lillycrop KA. Effect of maternal diet on the epigenome: implications for human metabolic disease. Proc Nutr Soc 2011;70(1):64-72. Martin R et al. Early life: gut microbiota and immune development in infancy. Benef Microbes 2010;1(4):367-82. Schlotz W and Phillips DI. Fetal origins of mental health: evidence and mechanisms. Brain Behav Immun 2009;23(7):905-16.